Made almost exactly one year before his masterpiece, Nosferatu (1922), F.W. Murnau's The Haunted Castle (1921) often seems like a trial run for the more famous (and clearly superior) film. If nothing else, it's a showcase for Murnau's mastery of light and shadow, but the film itself is an often unfocused murder mystery set in a gothic mansion that features neither hauntings nor castles. Haunted, in this case, speaks to memories rather than ghosts, as the mysterious Count Oetsch (Lothar Mehnert) crashes a weekend hunting party one dark and stormy night, upsetting the guests over rumors that he murdered his own brother. But Count Oetsch isn't there to strike again, he's there to reveal the identity of the real murderer, and along with the long-awaited Baroness Safferstätt (Olga Tschechowa), he sets about clearing his name and revealing the dark secrets of the the castle's citizens. Murnau is clearly a master craftsman, but The Haunted Castle is filled with portent and dread that never really add up to much, culminating in a final reveal that seems strangely anti-climactic. The film is only 81 minutes long, but it seems to drag on forever as it builds up to its climax, belaboring flashbacks and overwrought drama to mask the fact that it doesn't really have a particularly strong plot. It's certainly beautiful - Murnau crafts some of his most strikingly lovely shots here (a sepia-tinted flashback sequence is especially breathtaking), but the film's narrative is often left spinning its wheels. There's no doubt that Murnau could conjure up an eerie, Gothic atmosphere like no other, but that's really all that The Haunted Castle as going for it, and all the ominous looks and heightened dramatics really add up to nothing by the end. Murnau would recycle much of the best bits of the film for Nosferatu a year later (specifically a vampiric dream sequence that comes out of nowhere), which makes The Haunted Castle something of an interesting curio for fans of German silent cinema. 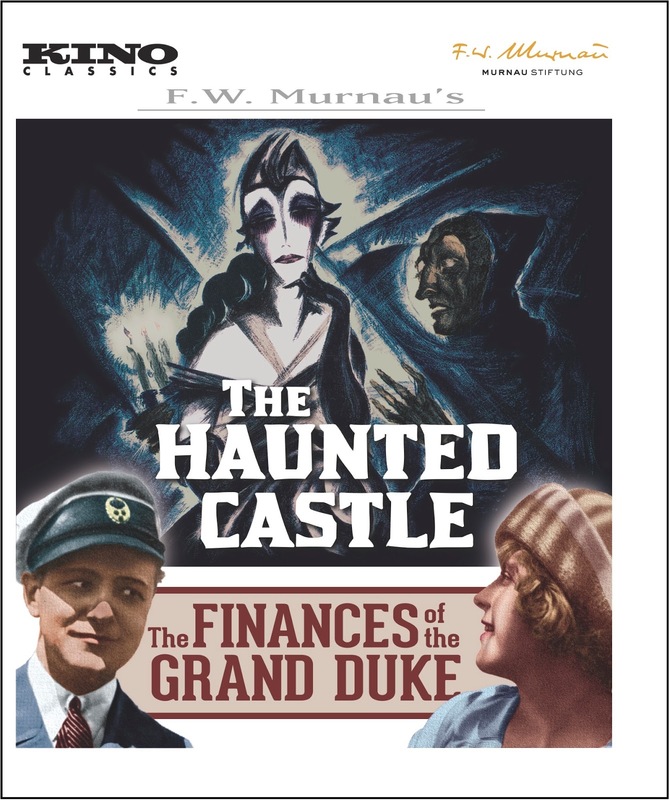 The Finances of the Grand Duke (1924) is essentially the B-side of Kino's new Blu-Ray release of The Haunted Castle, yet it's actually the stronger of the two films. Thematically, it makes a perfect pairing with The Haunted Castle - both films feature misunderstood aristocratic protagonists attempting to clear their name, outwitting the corrupt grifters and sycophants who seek to stab them in the back for their own advancement. THE FINANCES OF THE GRAND DUKE. Yet the 1924 film takes an entirely different approach to the material. Whereas The Haunted Castle is dark and portentous, Finances of the Grand Duke is light and comedic, taking a much less self-serious route to similar ends. Murnau was not a filmmaker known for making fluffy comedies, and there are certainly darker underpinnings to the story as the Duke's enemies attempt to have him assassinated (a plot line clearly inspired by the assassination of Archduke Franz Ferdinand 10 years prior). Yet by shaking off the gloomy and sinister trappings of The Haunted Castle Murnau actually delivers a much more focused and straightforward film. Working from a screenplay by none other than Thea von Harbou (a frequent Fritz Lang collaborator who also wrote Metropolis, M, Dr. Mabuse, The Gambler, The Testament of Dr. Mabuse, Die Nibelungen, and Destiny), The Finances of the Grand Duke is a bit of a madcap caper in which a debt-ridden duke attempts to escape creditors and other vultures looking to tear his kingdom apart in order to marry the much wealthier princess of Russia, who is likewise surrounded by incompetents and corrupt bureaucrats. While "charming" is perhaps not the right word to use her, Murnau is clearly having fun with this, and it feels fresh and invigorated where The Haunted Castle felt bloated and heavy-handed. There are chases (both by sea and by car) mistaken identities, disguises, and kidnappings, piling on subplots without ever losing focus of its ultimate goal. The 1994 restoration on the new Blu-Ray edition leaves something to be desired - the film is in dire need of a clean-up, especially in comparison to the lovely (and more recent) restoration of The Haunted Castle. Yet the disc's sole special feature is a commentary track on The Finances of the Grand Duke and one can't help but wonder why this film didn't merit its own separate release, rather than as the bottom of a double bill of lesser Murnau works? Regardless, in an age of ephemeral digital media (RIP Filmstruck), physical media is more important than ever, and the chance to own these two oft-overlooked films should excite cinephiles and silent film fans everywhere. Even at his most minor, Murnau was a fascinating filmmaker whose ability to paint with light remains as striking as ever, and watching him attempt to satirize the privileged in Weimar-era Germany is a hard prospect to resist. Available on Blu-Ray and DVD from Kino Lorber on Feb. 12.